Enjoy the ocean views in this stunning 3 bed, 2 bath oceanview condo. 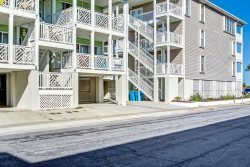 Only steps away from the Tybee Island pier! Access the home from a private elevator. The kitchen includes beautiful granite countertops, stainless steel appliances, as well as french doors which lead out to a spacious balcony. Spend mornings enjoying the ocean views while sipping on your favorite drink. Large windows surround the open floor allowing for natural light throughout. Master bathroom has a large separate shower and spa tub. Bright dining room leads into the living room which also has access to the balcony. Separate laundry room and custom built-in desk in the hallway. Private parking garage underneath the unit.